This topic contains 3 replies, has 3 voices, and was last updated by aronze 3 weeks, 4 days ago. My idea is a very simple. I want to bind my float variable(ScriptableObject) to Blackboard Variable as primitive float. If it is possible, we can use existing actions like MecanimSetFloat. I’m digging BBParameter and ScriptControl actions mechanism but if you’re also interesting about this, I want to hear your advice. Can you please clarify? What do you mean by saying “scriptable object float variable” for example? The scriptable objects can then be selected from nodecanvas when selecting a variable. Thanks for share your code, @wanderfalke. Yes, my idea is exactly same. This approach is very powerful. Variable asset easily can be use anywhere even out of scene. If you want more, see this link (Unity Documents). 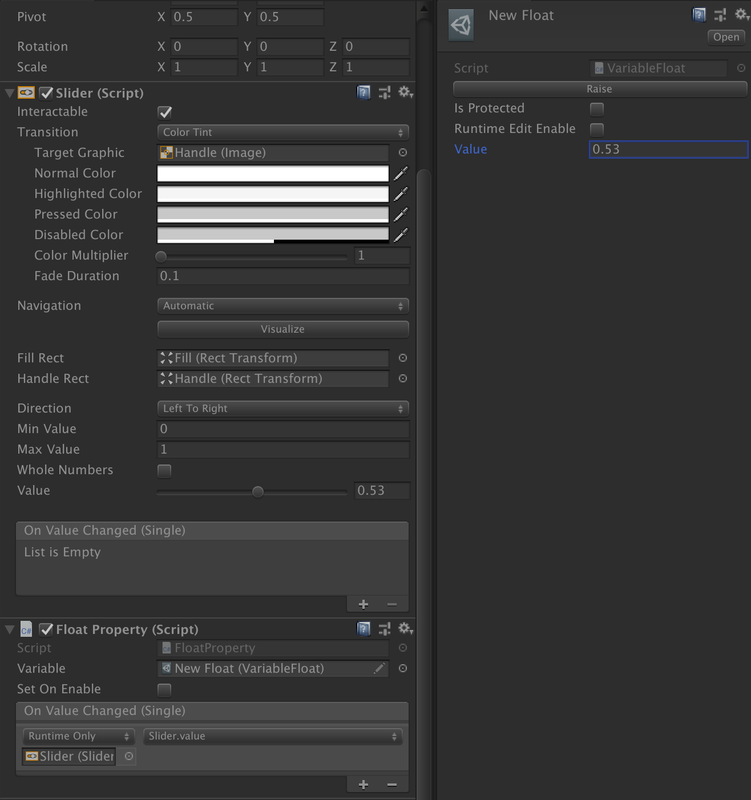 Create FSMOwner, Blackboard to my character object. Create Blackboard variable and link VariableFloat. If detect collision, decrease VariableFloat. In step 3, I want to use just NodeCanvas.Tasks.Actions.SetFloat. I don’t want to create new actions. BBParameter already have binding feature. So I think it can be.